Transfiguration Church in Berestove (Церква Спаса на Берестові; Tserkva Spasa na Berestovi). 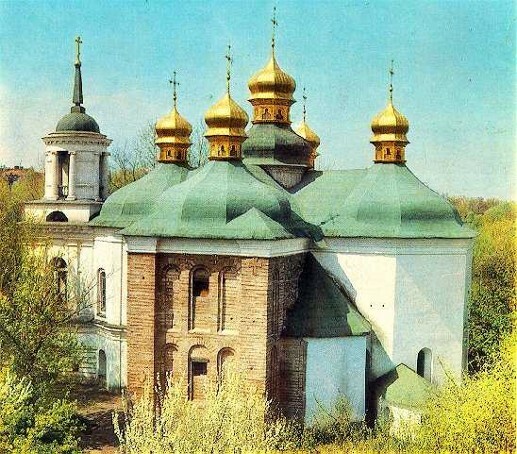 A medieval architectural monument built probably in the early 11th century during the reign of Prince Volodymyr Monomakh in the village of Berestove (now part of Kyiv). It was a typical three-nave, three-apse church with a single dome resting on six pillars. 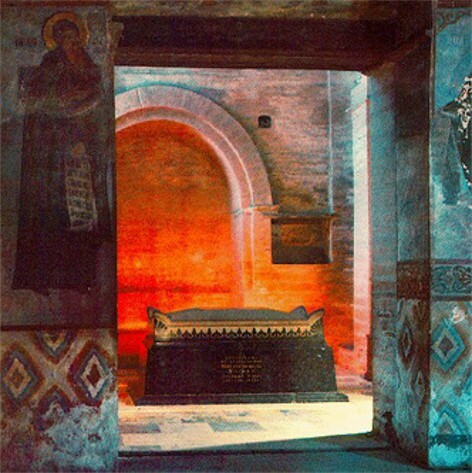 First mentioned in the Kyivan Rus’ chronicles under the year 1072, it served as the mausoleum of the Monomakh dynasty (including Grand Prince Yurii Dolgorukii). The church was destroyed by Khan Mengli-Girei in 1482. 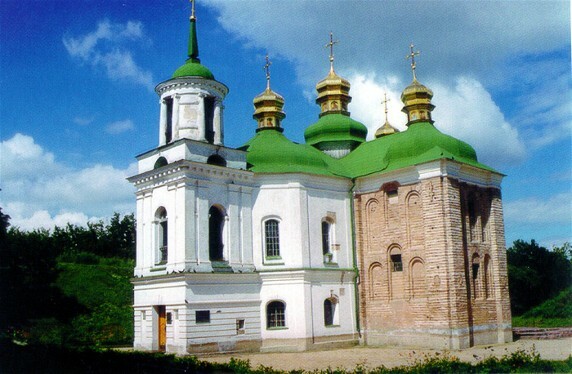 A new church was built on its ruins under Metropolitan Petro Mohyla in the Cossack baroque style in 1640–2 and decorated in 1644. 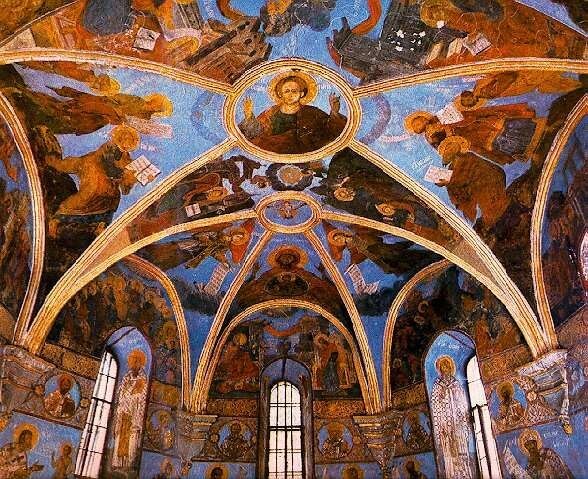 The interior (including a fresco ‘Gift of Petro Mohyla’ with a portrait of Mohyla) was painted by Greek masters, the ground plan was changed to form a cross, and four domes were added. The church was renovated in 1751–2 and again in 1813–14, when Fedir M. Korobka carved an elaborate altar, and Andrei Melensky designed a campanile in the classicist style. 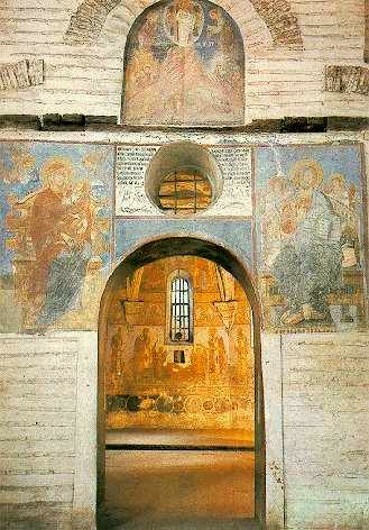 Of the original structure only the western part, with the narthex and choir, has been preserved. In the early 1970s a 12th-century fresco ‘Miraculous Fishing’, depicting Christ walking on water toward a boat, was uncovered in the church. The church is part of the National Kyivan Cave Historical-Cultural Preserve.